I’ve signed up Me Made May! 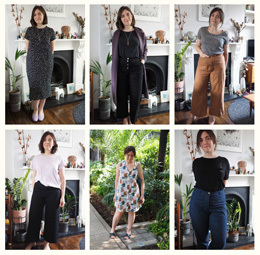 I heard about it via a lot of the sewing blogs I follow and it seemed a great way to encourage myself to continue with my fledging sewing hobby. The idea is to set yourself a handmade challenge and spend the month of May fulfilling it. 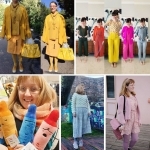 It’s a fairly open brief and you can choose a challenge that suits you – whether it’s just mending some old items of clothing so you can use them again, pledging to wear something homemade every day, or using up your fabric stash. 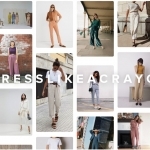 The premise is to get people thinking about the clothes they own, wear and make, which seems particularly pertinent given the sad news from Bangladesh last week, and ongoing issues with high street supply chains. Have a look at the full rundown here. What’s my challenge? I’ve bought these three lovely fabrics recently – a heavy grey jersey, a lighter pink-marl jersey and some cotton chambray – and I want to use them to make three everyday wearable pieces. I’m also going to try not to buy any new store-bought clothes all month and have a wardrobe clearout, too. I already have plans: the chambray will become a Scout, but I plan to add a dipped hem, rolled-back sleeves and perhaps a chest pocket like this Marc Jacobs tee. Man, I can’t just leave a pattern alone. 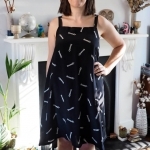 With the jersey I want to try replicating a couple of my favourite pieces from my wardrobe that I wear to death: this Topshop jersey dress and slouchy dip-hem top. I’m not sure yet whether to use a pattern, or draft my own based on tracing the garments. Head over here if you fancy taking the pledge yourself, and I’ll keep blogging my progress.